Having used watercolours for a while it was lovely to go back to my favourite medium and try out the new Derwent Procolour range. 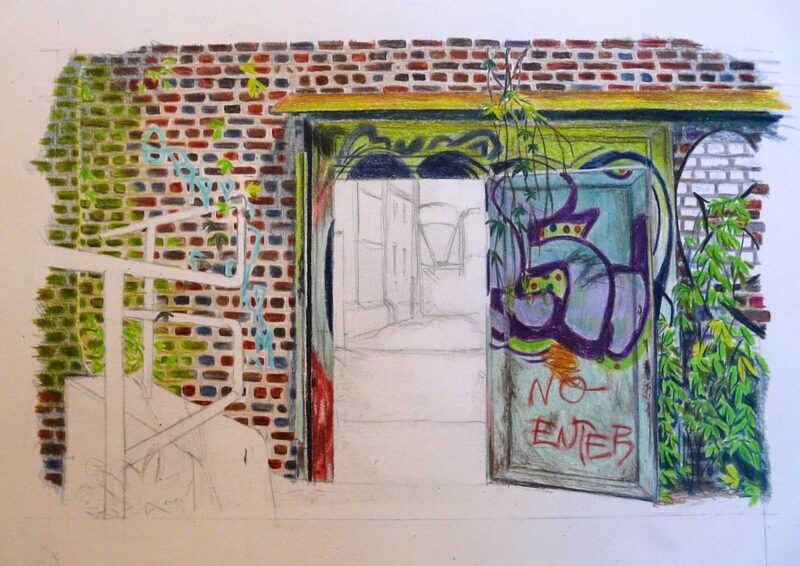 I was keen to see how well the pencils blended and the level of colour saturation that I could achieve with them. 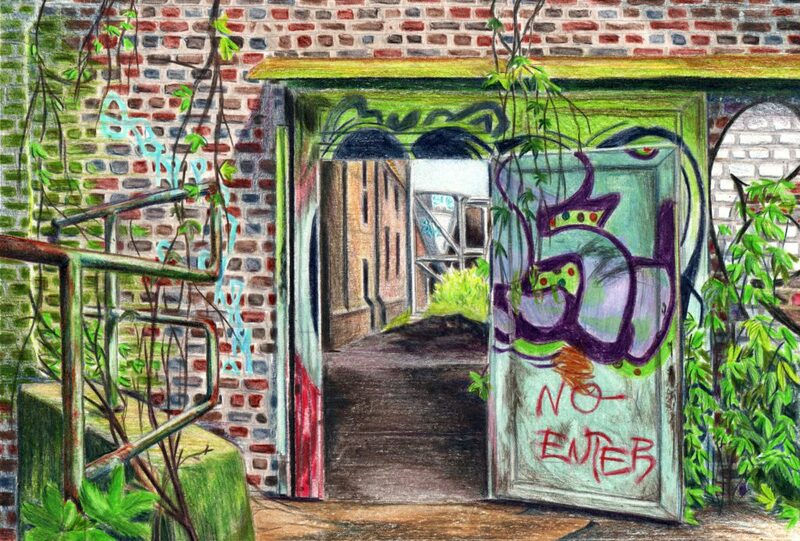 Living in the industrial Midlands, I often depict urban landscapes so the scene of a derelict factory covered in colourful graffiti seemed the obvious choice to test them out on. 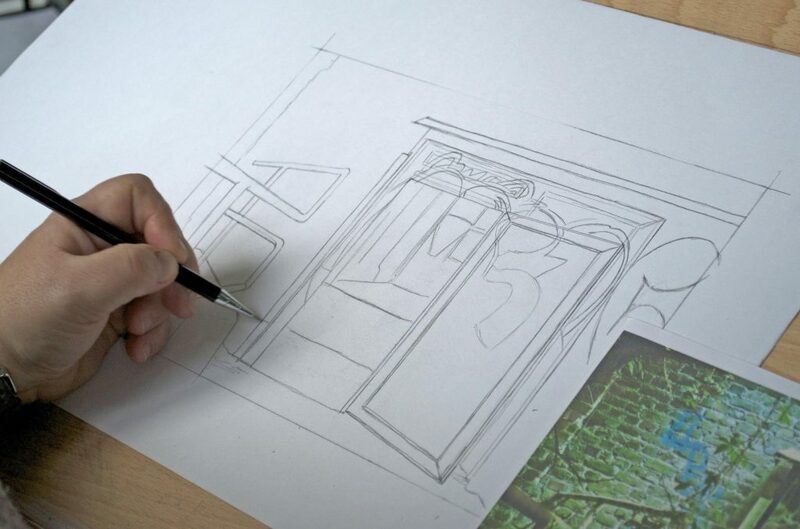 To lay down the initial sketch I used a Derwent Precision pencil. This fabulously comfortable pencil, with an ergonomic metal barrel, enabled me to produce a light sketch and I able to quickly cover the paper as there was no need to sharpen it. The handy eraser, tucked in the lid, was a useful addition. 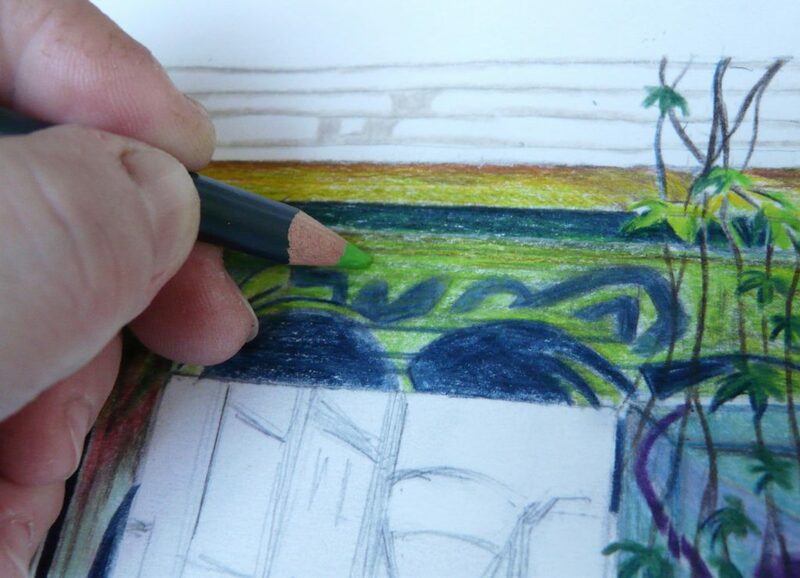 I then began layering colour on the paper using the Derwent Procolour coloured pencils, starting with the highlights which I worked over with deeper tones, blending them to give me a wider range of colours than the initial 36 pencil set provided. I was impressed with the precise lines I could achieve with their hard points – yet they were soft enough to allow for solid block coverage as well. The pencils were extremely comfortable and satisfying to use, and the richness of colour achieved was delicious. In fact, after completing the factory brickwork and looking at the results, I realised that the brick colours were a little too strong taking impact away from the graffiti . Cue the Precision eraser. 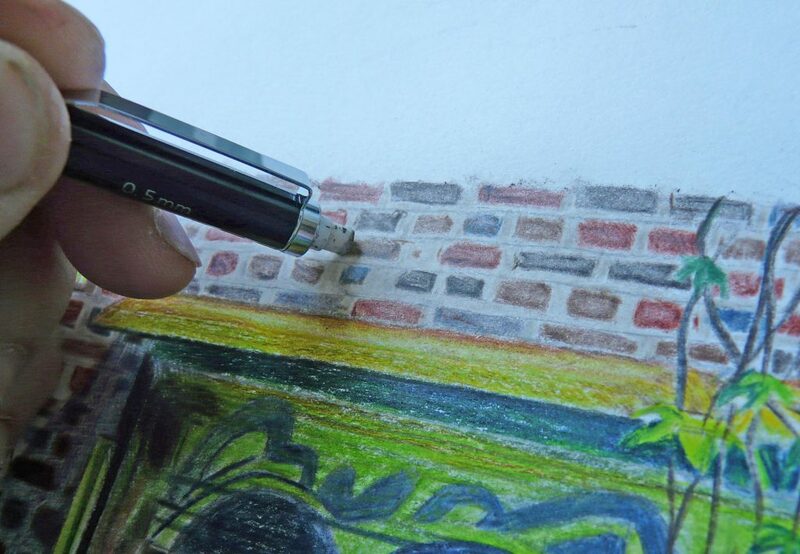 With it I was able to precisely lift a little of the colour from the brickwork without removing all of the pigment or damaging the paper, giving me the faded masonry effect that I was aiming for . The blending ability of the Derwent Procolours came into their own when I moved onto the factory railings. Covered in rust and peeling paint the railings were a challenge but these wonderful little sticks of colour allowed me to put down layers of tone, seamlessly blending together to create the look of rusty old metalwork, with the highlights removed by the Precision eraser. Overall, I was really impressed with the finished result . 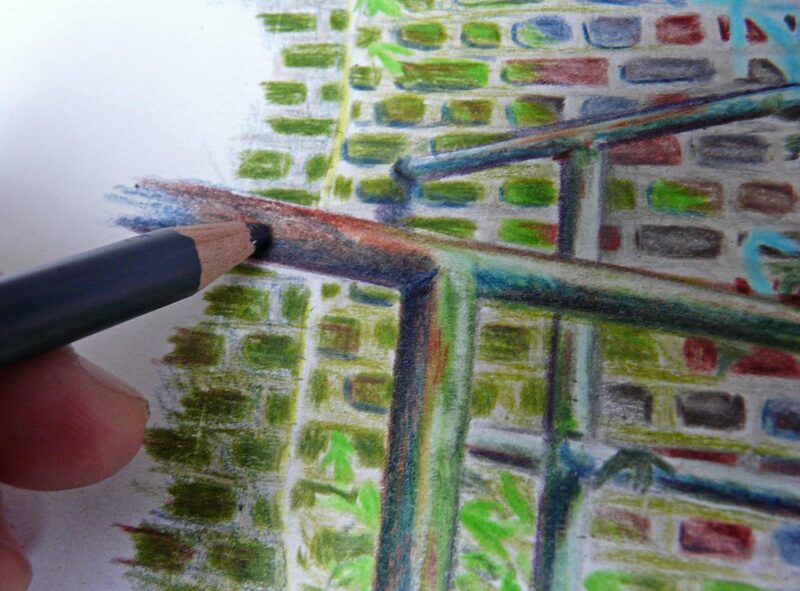 The Derwent Procolours’ solid core enabled me to sharpen them to a good point allowing me to create much more detail than I can usually achieve with a lot of coloured pencils on the market. The depth of colour was outstanding and didn’t require the usual multiple layering of tone to achieve it – yet I was still able to remove some of the pigment in areas that I needed to easily. The intensity and vibrancy of colour lent itself well to the subject matter I chose. I’d forgotten how wonderfully tactile pencils are to use and the Procolours are a fabulous addition to Derwent range… I think my paint brushes will be gathering dust for a while now!